The quarterback controversy of this past week was Bills coach Sean McDermott getting an itchy trigger finger and benching an underwhelming-if-not-terrible Tyrod Taylor. 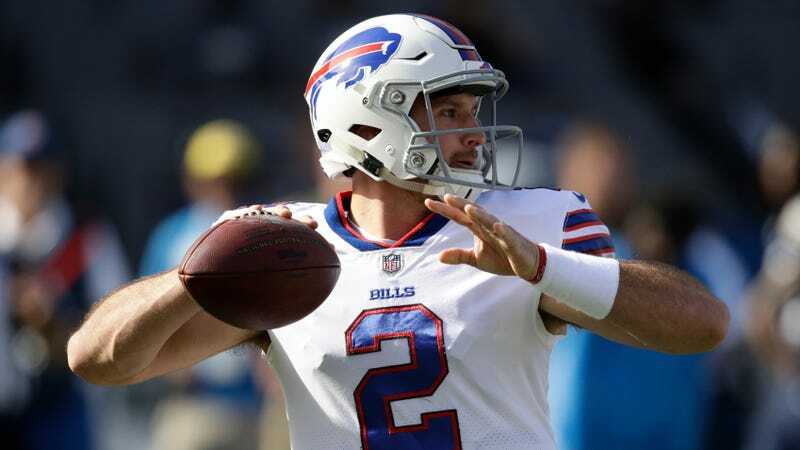 Taylor was demoted in favor of rookie fifth-round draft pick Nathan Peterman, who the team wishes could be its franchise QB of the future. The Peterman era did not begin well. On the bright side, in his 14 passes in the first half, Peterman only had three incompletions. However, only six of his throws went to Bills receivers, with another five getting intercepted by Chargers defenders. In fairness, at least one turnover was pretty unlucky—this deflection that went back for a pick-six. A couple, however, were just ugly, like this off-balance monstrosity. For what it’s worth, Taylor has three interceptions on the entire year, with 254 passes thrown. Update (6:05 p.m. ET): With the Bills down 40-7 in the third quarter, Tyrod Taylor has been mercifully returned to the first-string offense.